Bikram yoga is hot, hot, hot. Bikram yoga is hot, literally and figuratively. The brainchild of yoga master Bikram Choudhury, who created a form of yoga consisting a grueling 90-minute sequence of 26 yoga poses in a room heated to 105 degrees, Bikram yoga has become extremely popular. The heat increases the intensity of the workout, but research to date doesn't support claims that a Bikram yoga session is a cardio workout. Writing in the "Huffington Post," fitness trainer and author Ben Greenfield opines there is "zero chance" that a hot yoga class constitutes an adequate cardio workout. Cardio workouts, which call for a sustained period of physical activity that gets your heart working hard, yield a myriad of health benefits. Thirty minutes of moderate-intensity exercise five days per week strengthens your heart and reduces your chances for heart disease. But as the IDEA Health & Fitness website explains, a cardio workout also helps protect against many other serious illnesses and conditions, including strokes, certain types of cancer, type 2 diabetes, obesity, arthritis, stress and depression. Bikram and other forms of yoga produce significant benefits, including an increase in flexibility and balance and a decrease in stress. A 2006 University of Wisconsin study, reported in the Journal of Strength & Conditioning Research, compared one group that participated in basic yoga sessions against a non-yoga control group. It discovered that the yoga participants increased flexibility, balance, muscle strength and endurance, enabling them to do significantly more push-ups and curl-ups. Some Bikram yoga advocates claim that a 90-minute session burns 500 to 1,000 calories. This would compare favorably with other forms of vigorous cardio workouts such as running at a decent pace. The claim is based on the theory that the heat and humidity in a Bikram yoga room creates a higher oxygen demand than normal conditions and forces the lungs and heart to work hard enough to constitute an aerobic workout. The 2006 Wisconsin study also measured potential improvement in the aerobic capacity of the group that participated in yoga classes against the non-yoga control group. It found no significant changes or improvements in aerobic function. As research study leader John Pocari told ACE Fitness Matters, "To improve aerobic capacity, you really have to be working in the aerobic training zone. Based on what we found, the intensity just wasn't there." A study in 2007 found that Ashtanga yoga, more vigorous than regular yoga classes, was more aerobic, but only compared in intensity to gardening or walking the dog. At the IDEA website, trainer and yoga instructor Elizabeth Bain states that a heated yoga room, in and of itself, doesn't enable you to burn more calories or increase the intensity of your workout. "If it did, the most popular way of losing weight would be to lounge around in the sauna!" Check with your doctor before starting a new exercise routine, such as Bikram yoga. MayoClinic.com says that heat and humidity in a hot yoga room can lead to dehydration, heat exhaustion and even heat stroke, a potentially fatal condition. People with heart disease, high blood pressure, a history of heat illnesses and pregnant women should avoid hot yoga. Huffington Post: DoesYoga Count as Cardio? IDEA Health & Fitness Association: Does Doing Yoga in a Heated Room Help with Weight Loss Compared to Doing Yoga in a Regular Temperature Room? American Council of Exercise Fitness Matters: Does Yoga Really Do a Body Good? MayoClinic.com: What's Different About Hot Yoga? Can Indoor Cycling Help You Get in Shape? How Many Calories Does 90 Minutes of Bikram Yoga Burn? Are Stair Climbers Better Than Running? 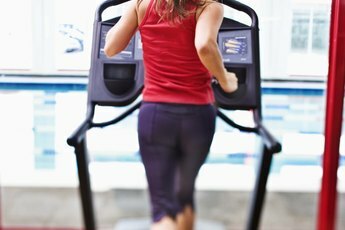 What Cardio Do You Do if You Want to Slim Down & Not Build Muscle?